Figure 10 Similar stiffness values are found under pro-fibrogenic conditions in human and cellular studies. 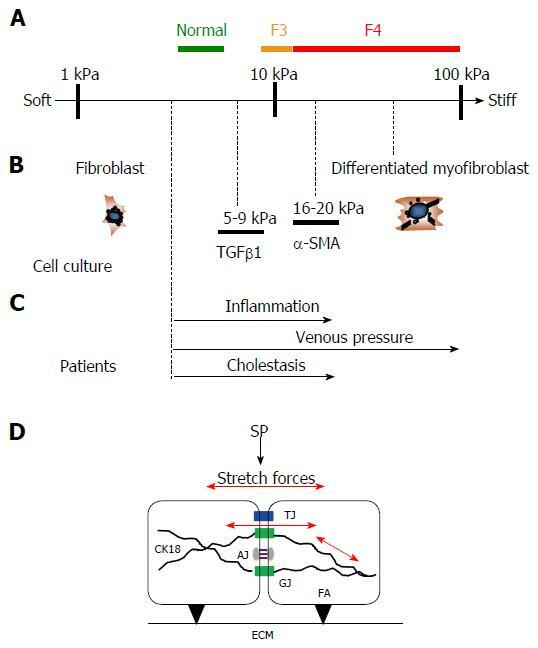 A: Stiffness scale with cut off values for normal, F3 and F4 fibrosis (cirrhosis) in humans; B: Known stiffness conditions to activate fibroblasts using atomic force microscopy in cellular studies (modified from Ref. ); C: Known LS values in various pathological conditions from human studies that ultimately cause liver fibrosis (modified from Ref. ); D: Potential intracellular and intercellular mechano-signaling via intercellular junctions through stretch forces caused by SP elevation. Besides interactions of focal adhesions (FA) with the extracellular matrix (ECM), SP causes intra- and intercellular stretch forces (red arrows) of perisinusoidal cells which are important for matrix production. Several intercellular junctions are schematically shown that may play an important role in biomechanic stretch signaling such as tight junctions (TJ), gap junctions (GJ) and adherence junctions (AJ). Intermediate filaments such as cytokeratin 18 (CK18) play a critical role in liver disease. CK18 is interacting with intercellular junctions and, hence, is most likely important for biomechanic signaling. LS: Liver stiffness; SP: Sinusoidal pressure.